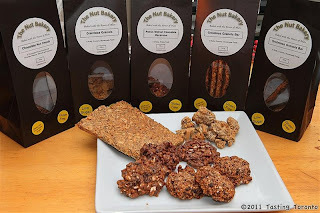 Nut-lovers: There exists a bakery in Toronto which specializes exclusively in nut products (there is 1/4 lb. of nuts in every bag of their product, actually). And I have to tell you - I've tried all their products first-hand and they are delicious. The Nut Bakery sent us some samples of both their low sugar and pure cane sugar varieties of Grainless Granola (chunks), Grainless Granola (bars), Pecan Walnut Chocolate Macaroons, and Chocolate Nut Chunk. The latter two were definitely our favourites. None of the products were too sweet, and just one or two pieces gave you energy for days (I'd recommend everyone have an emergency bag at work - you never know when a late night where you need brain power will come, because as we all know nuts are incredible brain food and I've also heard they can have a mood-stabilizing effect). The only fault I found with them was that the low sugar varieties, of course, have a bit of an aftertaste that the pure cane sugar ones don't, which is simply part and parcel of having to use a sweetener in place of sugar. But it provides a nice alternative that diabetics can savour. Also, those with Celiac disease can indulge safely in these products, as all are gluten free because they use nuts in place of grains. I had brought the remains of my least favourite, but still delicious, Grainless Granola Bars to work and my colleagues were amazed. I told them I wish they could've tried the Chocolate Nut Chunk and the Pecan Walnut Chocolate Macaroons, but I ate them all before any leftovers could make it into the office! Here is a list of places where you can get your hands on their products if you're interested in trying them out.